Sales of prescription psychiatric drugs such as Xanax and diazepam via darknet online drug markets have increased in the UK at an alarming rate, according to new research by the University of Kent and King’s College London. The findings validate concerns that non-medical prescription drug use (NMPDU) is becoming increasingly common in the UK and that policy makers need to act to address this issue. Researchers from the universities set out to examine the scale of NMPDU via sales made on the darknet of three key drug types: sedatives, stimulants and opioid dependency products. They did this by analysing these types of drugs sold on 31 cryptomarkets in the USA, UK, Australia and European nations such as Germany and Sweden between September 2013 and July 2016. In the UK the proportion of sales of sedatives such as alprazolam (popularly known by its trade name Xanax) and diazepam had increased by just under a percentage point (0.9%) each year over the study period to around 12% of the total of all drugs sold via the darknet in the UK by 2016, behind drug groups such as cannabis, MDMA-type products and cocaine. The researchers said this should alarm policy makers and demonstrates an increasing interest in these products. 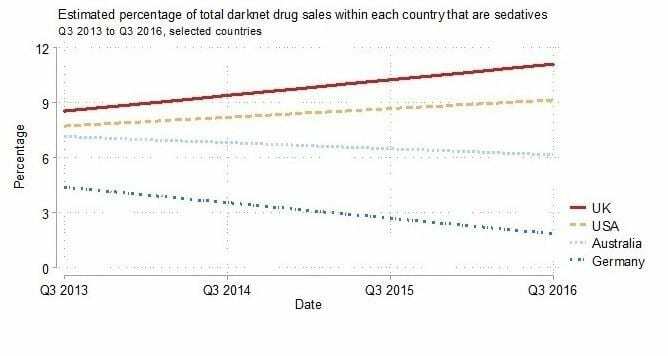 Furthermore, this meant the UK accounted for close to a third (31.1%) of all sedatives sold on the darknet in the data analysed, not far behind the US that had the largest share at 41.4%. The report also notes that sales of Xanax are catching up with the more traditionally used UK sedative diazepam – growing from 10% to a quarter of sedative sales monitored over the study period. The USA had the largest share of other prescription psychiatric drug sales monitored. In total it accounted for 59.2% of all stimulant sales monitored and 64.4% of opioid dependency products such as suboxone and methadone. Sales of sedatives and stimulants increased by half a percentage point, pointing to an increased popularity, though more muted than the increase for sedatives in the UK. The researchers say the findings have a number of policy implications, not least by confirming that non-prescribed sedative demand is an increasing issue in the UK relative to other drugs, as has been previously noted by Public Health England, particularly with regards to the use of Xanax. The findings, co-authored with Dr Thomas Pollak from the Institute of Psychiatry, Psychology & Neuroscience, King’s College London and Dr David Décary-Hétu from the University of Montreal, have been published in the International Journal of Drug Policy in a paper entitled Nonmedical prescription psychiatric drug use and the darknet: a cryptomarket analysis.